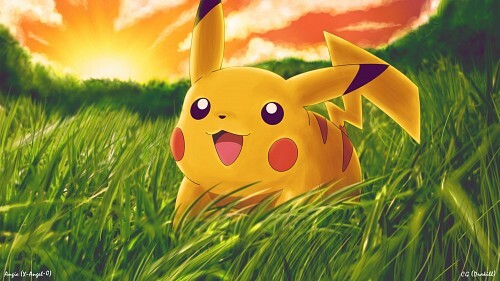 This is a collaboration Pikachu wallpaper. And now it's finally complete. Unfortunately we don't know exactly how long it took to make this. Since we both have completely different styles, I thought that this wallpaper actually came out quite nicely. Angie: "I just smudged the grass and painted the sky, then some gradient maps and blending changes and there it is! XD "
Below are some of the links that we used in making this wallpaper. this is the one I saw, nicely done, I like this one better anyways. hopefully it's approved, if not, it's still nice and cute. You two need to do another colab...Akira maybe? though i must to say, i was surprised to see such a cute wallie from mister Horror-lover Drakill!